That "L" in "L.A."? It's for "Lucky". Conductor James Conlon will be staying on as music director of the Los Angeles Opera at least through the end of the 2012-13 season, the company said Monday. His contract was set to expire at the end of the current 2010-11 season. Conlon joined L.A. Opera in fall 2006, succeeding conductor Kent Nagano. Mad props to L.A. Opera and with Maestro Conlon -- who in March was interviewed by Opera Chic. For 100+ years, Chicago's summer festival offers music for the masses (from June until September) in unfussy settings, giving some of opera's coolest talent a place to hang out, sing, and get paid. 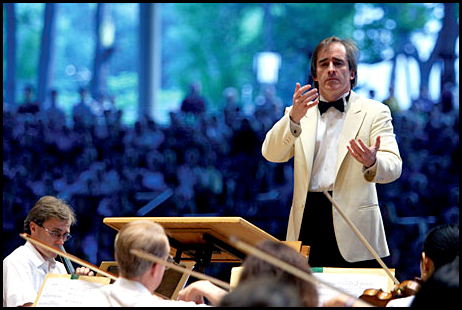 Last week's Ravinia gave concert versions of Mozart's Le Nozze and Così fan tutte with Maestro James Conlon and the CSO in celebration of Conlon's 60th birthday (he's also Ravinia Festival's Music Director). 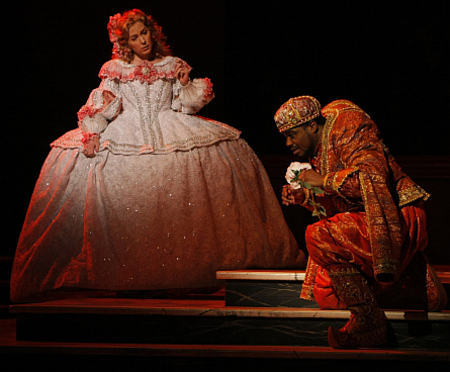 Le Nozze was with Nathan Gunn as the Count, Ailyn Perez as the Countess, Lisette Oropesa as Susanna, and John Relyea as Figaro. The night prior was Così fan tutte with Frederica von Stade's Despina (photo above with Maestro Conlon), Ana Maria Martinez's Fiordiligi, Ruxandra Donose's Dorabella, Rodion Pogossov's Guglielmo, and Saimir Pirgu's Ferrando. He likes to eat healthy — he often snacks on Balance Carb Well Bars and organic fruit — but he doesn't go the gym. "'Götterdämmerung' is my workout," he says. Opera Chic's own interview with Conlon from earlier this year is here. Los Angeles Opera will make history in May by unveiling the company's first complete Wagner Ring cycle: it carries a chunky $32 million dollar price tag, and was created by director/designer Achim Freyer. Among the less-traditional choices made for the staging there are light sabers and puppet heads (photo below). Freyer's new production was already staged in parts for L.A. Opera the past year: Das Rheingold in February/March 2009; Die Walküre in April 2009 (with Plácido Domingo as Siegmund); Siegfried in September/October 2009 -- now Götterdämmerung’s premiere is imminent for April 3, and after its run, Der Ring des Nibelungen will be presented in L.A. Opera's first complete performances (in three full cycles) that will take over Los Angeles in May & June. The man behind the Ring initiative is the Music Director of the L.A. Opera James Conlon, who has championed Wagner through his career and conducts all of Wagner’s works for the L. A. Opera. The American conductor's 60th birthday is today (YAY!) and Conlon’s still trailblazing. When he’s not at the L.A. Opera, he divides his time guest conducting at the world's top houses (we had him at La Scala in February for Rigoletto). He's also Music Director of the Ravinia Festival (the summer home of the Chicago Symphony Orchestra), and Music Director of the Cincinnati May Festival. His early career was marked as Principal Conductor for Paris National Opera, General Music Director of the City of Cologne, and Music Director of the Rotterdam Philharmonic. All richly deserved, he’s got a couple of Grammys, a 2004 Commander de L’Ordre des Arts et des Lettres and a 2002 Légion d’Honneur. In addition to Götterdämmerung and this summer's Ring cycle for L.A. Opera, Conlon's rehearsing a new production (by Ian Judge) for the U.S. premiere of Franz Schreker's late-romantic tragedy, Die Gezeichneten (The Stigmatized), the first time a Schreker opera will be heard in the USA (although his work has been staged in Europe). Four performances will be given of Schreker's best known work, and will be presented as part of Conlon's Recovered Voices Series, a unique project that revives the works of composers who were silenced by the oppressive ideology of the Nazi regime, erasing a legacy of (mostly Jewish, but not all) composers and musical heritage. 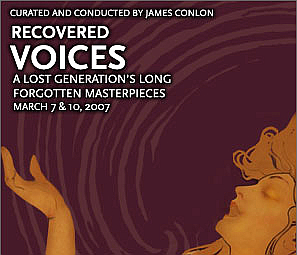 Conlon's Recovered Voice project was inaugurated for the 2006/07 season and includes the works of Walter Braunfels, Erich Korngold, Ernst Krenek, Erwin Schulhoff, Viktor Ullmann, and Alexander Zemlinsky. Opera Chic was able to speak with the American conductor in Milan while he was here last month to conduct (a critically acclaimed) Rigoletto at La Scala. We discussed with the maestro the L.A.’s Ring, his love for Zemlinsky and Varese, his ideas about interpretation, and all about Alma Mahler’s taste in men. After spending the last 20 years of his career working loads in Europe and Italy, the Kid from Queens (whose Italian language skills could trick you into believing he's a native speaker and he just gets the dead-Italian-composers-thing so dang well) has recieved a Lifetime Achievement Award from The Los Angeles Istituto Italiano di Cultura for his career-spanning dedication to classical music, spreading the gospel of Verdi, Rossini, Donizetti & Puccini to the unwashed masses. Music Director of the Los Angeles Opera, Maestro James Conlon, joins previous award-winners who have excelled in the arts like Renato Bruson, Ennio Morricone, Francis Ford Coppola, Frank Stella, and Renzo Piano. "speaks perfect Italian, and he ruthlessly chases the «parola scenica» that singers nowadays tend to overlook... a Rigoletto such as this, under Conlon's baton, is unforgettable. He is an authoritative maestro, and manages to repair, for the time being, Scala's orchestral sound, and he makes it shine -- from strings to brass. He has a perfect understanding of the dramatic relationship between moments of different intensity. He's fluent in the interpretive tradition the way conductors of the old school used to be fluent. His control of the score is steely, and we hear that from the beginning -- he elegantly conducts the archaic dances of the opening scene... Conlon is one of the maestri who deserve to appear every year here"
"if he's Rigoletto, the night's success is guaranteed: he is a good, humble man, witty and a scholar of acoustics: he radiates a sort of charisma that somehow makes the entire cast sing at their best". Last night at la Scala, the opening night of Rigoletto, conducted by James Conlon with Leo Nucci as the giullare, whipped the audience into a frenzy of a final nine-minute ovation for the singer -- it was Nucci's 440th career performance of the part -- and the American conductor. If opera, like baseball, had a Hall of Fame, Nucci -- who's so humble he insists not to be addressed as maestro, even if he deserves the honor more than many, many conductors -- would be a first-ballot inductee . Conlon, Falletta, Gilbert, Robertson, Slatkin, van Zweden... Colorado's summers are not only made of glorious woods and creeks and lakes and mountains (and the Jesus-loving Colorado Rockies games): they're also chock-full of conducting goodness. Opera Chic's more accustomed to oceany or Mediterraneany summers (Montauk @ land's end, Pantelleria, Isola del Giglio) and winters in the mountains: but Colorado's clearly not all about the skking holidays. The full list of performances is here. James Conlon will be awarded the Galileo 2000 Prize in a ceremony to occur June 25, 2008 at the Scuderie Reali della Pace in Florence. Maestro Conlon will be the twelfth recipient of the music prize -- past winners include Zubin Mehta, Riccardo Muti and Daniel Barenboim. The Galileo 2000 Prize, founded in 1996, is awarded each year to an artist who has made a significant contribution to music, art and peace. Maestro Conlon, of course, is the man behind the Recovered Voices project, by far one of the most important musical initiatives of the post-WWII era, devoted to presenting works suppressed by the Nazis, and L.A. is really, really fortunate to have him -- Maggio Musicale Fiorentino, too. Tomorrow night the great James Conlon offers L.A. audiences two works of his Recovered Voices project, by far one of the most important musical initiatives of the post-WWII era, devoted to presenting works suppressed by the Nazis -- in this case, Viktor Ullmann's The Broken Jug (in the photo above) and Alexander Zemlinsky's The Dwarf (photos below). Whenever the topic "musicians who seldom get the credit they deserve" comes up, a goto example of this sad phenomenon is maestro James Conlon (and this is not just a New Yorker's pride on my part): he is a fine, fine maestro, with a keen understanding for Verdi's raw emotional power and he gets Verdi's talent for nuance. And Conlon's a good man, to boot. He's in rehearsals now at Bologna's Teatro Comunale for his Falstaff, directed by Wimbledon champ Pier Luigi Pizzi, debuting next week. One of Pizzi's witty ideas, and I hope we're not spoiling anything here for the audience, is that the ending of the opera causes the sets to fall apart, destroying the fiction of the theatre and revealing the stage machinery beneath the sets. 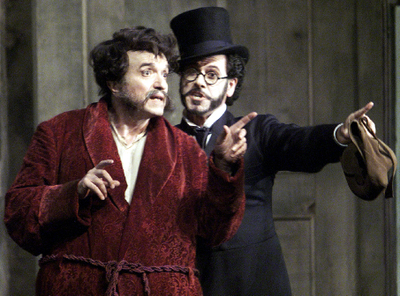 "Big Belly", as Verdi called him during the feverish writing of his last great work, will be Ruggero Raimondi (in the photo above, courtesy of Salzburg Festival, Raimondi in Salzburg in 2001 as Falstaff, Claudio Abbado conductor). "I always dreamed of staging Falstaff -- Pizzi explained during the press conference at the theatre -- It has perfect dramatic timing, it flows magnificently. It flows so well that I've decided to abolish one intermission, there will just be one intermission between the first and second act. 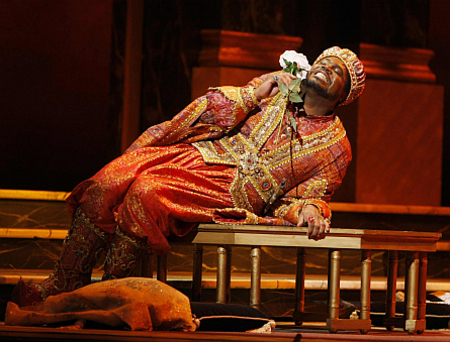 There's not a dull moment in this opera, a race toward folly!". 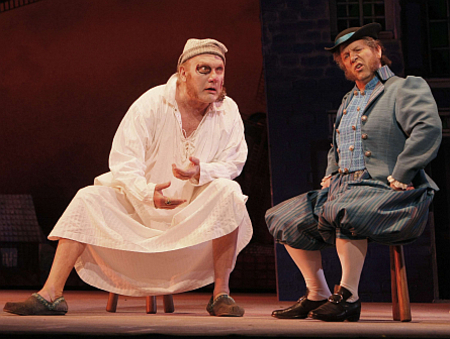 Pizzi's Falstaff takes place in the last decade of the 19th century. According to Raimondi, "this opera's characters are in constant evolution as the action barges ahead; but there are moments of reflection, of nostalgia". Conlon admitted that "every chance one has to conduct Falstaff is a joy, a special occasion" and then explained that the first time he saw the opera he was 14. It was Franco Zeffirelli's famous staging. According to the New York born maestro, "in Falstaff Verdi is a master of comedy, with a sense of irony: he very wittyly quotes his own work, Traviata and Otello for example ". When Los Angeles Opera's music director James Conlon lived in Germany in the early 1990s, he fell in love with the music of Alexander Zemlinsky. His passion led him to first conduct and then record the composer's little-known work. Then, Conlon turned to Zemlinsky's contemporaries. Namely, the other composers who were silenced by the Nazi regime. Music Director James Conlon will conduct Vicktor Ullmann’s The Emperor of Atlantis and Alexander Zemlinsky’s one-act opera A Florentine Tragedy during the first installment of the multi-year Recovered Voices project on March 7 and 10 at the Dorothy Chandler Pavilion. Now, Conlon plans to restore this lost generation's long-forgotten masterpieces to the concert stage with Recovered Voices, a multi-year project presenting the work of composers affected by the Holocaust. A similar project, Lost Composers, has already been undertaken by the University of North Texas, that revived important lost works by, among others, Opera Chic's beloved Paul Kletzki.